There is a unique book that tells the story of Ffald-y-Brenin, co-authored by Roy Godwin and Dave Roberts. 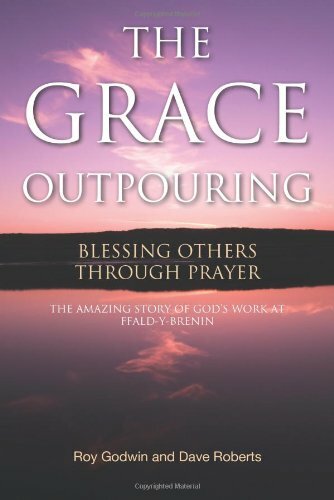 That book is entitled The Grace Outpouring. It’s a unique story of how Roy and Daphne came to lead the centre, as well as sharing stirring and powerful encounters they and others have had with the Holy Spirit while at Ffald-y-Brenin. The focus of the centre is that of a place of rhythms of prayer, reflective retreat and seeing people come to know the real and living presence of God. The Godwin’s have a true heart to see people blessed in the name of Jesus. What I found uniquely expressed in the book is how the leaders, Roy and Daphne, don’t try and force any move of God. They are very happy to allow people, in their own way and own time, to meet with God themselves, without giving ‘assistance’. Many times they will simply show someone the prayer chapel, God will begin to move in that person’s life, and they will simply slip out and go about their daily routine. Such is refreshing to read. Many beautiful accounts of people encountering the presence and power of the Holy Spirit are shared throughout the book – from a first-meeting with the living Lord, to healings, to prophetic words and much more. It wasn’t always straightforward. One afternoon I was interrupted by a knock at the door, and there stood another inquiring couple. Faced with a deadline for posting a form, I was internally wavering; but our hospitality habit prevailed and the kettle went on for tea. We did the tour and got to the chapel, but even before I could pray the prayer of blessing, they were visibly touched by the Holy Spirit. I slipped away to post my form. Later I was able to talk with them and explain what God had been doing. As they walked away to their car, another couple walked toward me. No! I’ve got to get this work finished, I thought, even as I outwardly smiled. Lord, I haven’t got time for this now; please turn the flow off! I explained that we were a Christian retreat centre, a place where the presence of God comes and people’s lives are changed because they encounter him. By now we were at the kitchen table, and he was telling a pornographic story while his wife blushed with embarrassment. I was finding all of this very difficult, but nevertheless I offered them a cup of tea. To my intense disappointment they said yes. While the kettle was boiling, he told another story that was even worse than the first one. I was ready to do some righteous rebuking. I didn’t want this in Ffald-y-Brenin, in my house and in my kitchen; but God said to me, “Don’t you dare rebuke this man.” It was that clear. This worried me. It was not the prompting I wanted to hear. I wondered whether it was God’s voice that I was discerning after all. We heard a third filthy story, and I explained more about the centre and what we believed about the presence of God there. When he started his fourth story, I just wanted to be rid of them. But I had made a commitment to God in the previous weeks that if he brought people to the centre I would stop, however pressed I was, put them first, and bless them. So I offered to show them around, hoping they would take the chance to make their escape and save me time and irritation. But his wife said yes, and the object of my wrath mumbled something about tagging along though not really being interested. I resisted the temptation to suggest he wait in the car. The centre was packed with guests, so I walked them around via the outside paths. However, we had to pass windows thrown open because of the heat of the day, and the stream of profane anecdotes did not slow down. Internally I was having an animated conversation with God: Please protect the hearing of the guests as this filth is paraded past their windows. Lord, I am committed to blessing this couple, but this is a real struggle. I loved reading this book, hearing of simple, yet profound, encounters with the living God. I am fully convinced that the powerful work of the Spirit of God is still available today, just as described in this book, just as described by the first Christians way back following Christ’s resurrection. And, so, I find such accounts stirring the deposit of God that is within, desiring that I and the larger community encounter his good work by the Holy Spirit. God is still very active, even in the west where everything must pass through the scientific method and reasoning. I don’t negate such a thing. But I don’t set it forth as highest in rank. The living God resides there alone. And to read of God’s work in our lives and in our community, and in the lives of others and their communities, will stir us more and more into the things of God. This entry was tagged book review, books, charismatic, continuationism, Holy Spirit. Bookmark the permalink.